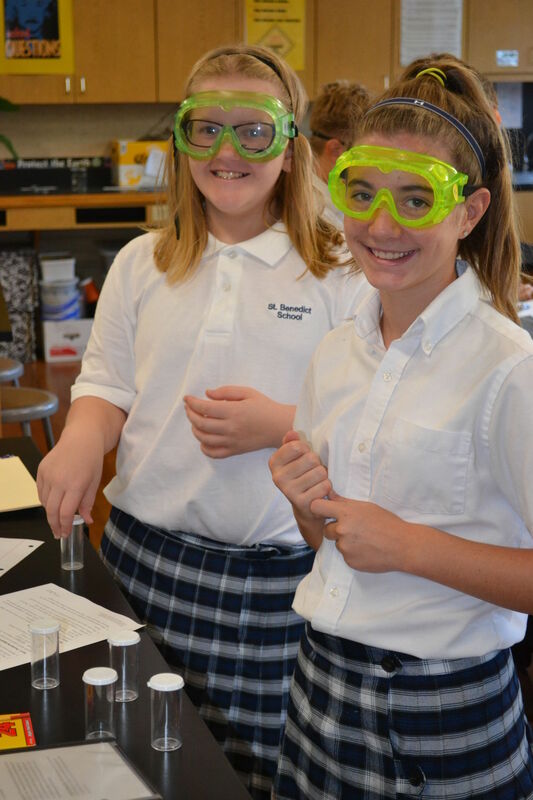 The Middle School encompasses Sixth through Eighth Grade with one class per grade. Having only one class per grade creates a close knit community where teachers and students know one another across grade levels. Students are, however, separated into two sections per grade for Math and Science. Students rotate classes using a traditional schedule, with daily attendance in core classes: Religion, English, Mathematics, History, Science, and Latin. Music, Art, Physical Education, and Seminar meet once per week. Several high school level courses are available to Eighth Grade students. In the classical method of education, the middle school period of instruction is generally called the "Logic Stage." This stage of educational development sees a shift in focus to more abstract thought with a focus on formal argumentation and connecting information through discussion. Classes involve more dialogue, analysis, and critique. Algebraic variables, geometric principles, and problem solving cap the Mathematics sequence. Students engage with the works of the great literary minds. Each year students write a research paper, gradually building in length and complexity. Students continue to practice memorization and develop the ability to effectively communicate orally and in writing. In Seminar, students read and discuss a variety of texts that expound upon a central, year-long theme. Finally, students begin to examine more complicated moral issues and develop an active faith characterized by prayer and enlivened by service within the school and broader community. The Institute for Excellence in Writing Program (IEW) is the school writing curriculum for grades K through 8 and allows for a seamless transition into middle school. IEW uses mimetic instruction and introduces stylistic elements to make writing beautiful and varied. Students are led to understanding by following/mimicking excellent models of writing. IEW says, "We model compositions similar to the classical rehetoric exercises. We use classical figures of speech. We value imitation. We practice memorization as a discipline. We teach how to speak well. IEW's unique approach provides the structure that students need to develop confidence in the writing process, while gradually guiding them toward greater independence and creativity. They will learn nine (seven in grades K-3) structural models (note taking, writing paragraphs, stories, simple reports, writing from pictures, research reports, creative writing, essays, and critiques) to help them organize any type of composition. Additionally, stylistic techniques (strong verbs, quality adjectives, sentence openers, and more) are taught incrementally to gently move students from the basics into more sophisticated writing."